Falls winter activities, and sledding is one that’s a blast for all ages! The rush of sliding down a snowy hill is unlike any other you or your family will experience. 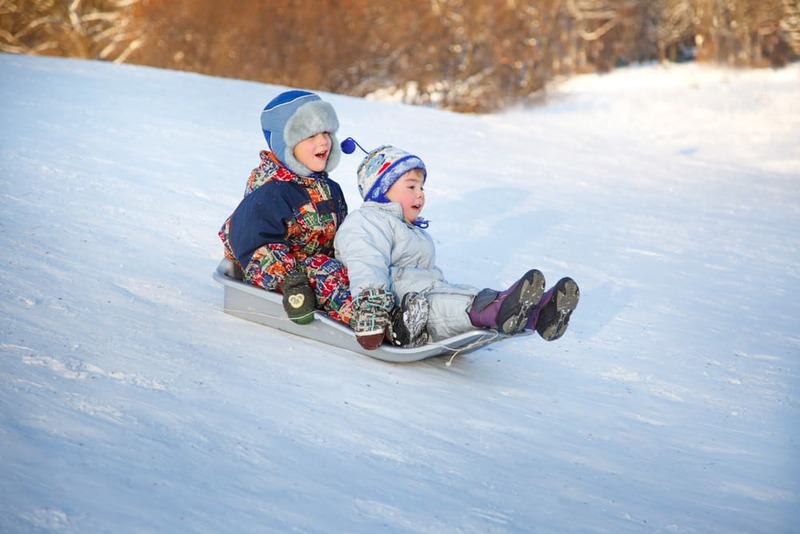 When you’re deciding on fun things to do near Niagara Falls, make sure sledding tops your list. If you’re looking for “sledding hills near me” and live near Niagara Falls, look no further. 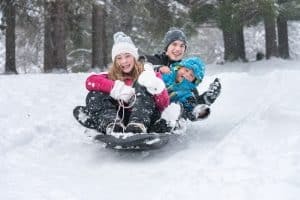 We’ve compiled this collection of sledding spots for locals and tourists alike to check out some of the best snow sled activity locations in the area. There’s a little hill for small kids to sled on, and if they get bored, there’s also a playground to enjoy. In between sledding trips, check out the historical plaques throughout the park, including one that describes the founding of Thorold. There are plenty of walking paths and a time capsule in the park, too! This park might be the best option for dog lovers, because there’s a dog park near the sledding hills. Sledding is common here in the winter time. At this park, you can also check out views from the observation gazebo and see creeks empty into Lake Ontario on the grounds, which also include covered picnic facilities, benches and a boardwalk. In addition to tobogganing hills, Chippawa Park has an area for skating in the winter, too. The small hills here make it a great place for young children, plus there are restrooms and plenty of parking. There’s a sledding hill at this park for winter family fun, and the park also hosts events. Take a walk down the water’s edge after your toboggan trip. There are plenty of spots to sled here in this sprawling park, with lots of little hills that make it great for young kids. Take the family sledding, then explore one of the many nature trails in this park, or play on a playground. Head to this tobogganing hill that has decreasing heights as you move from end to end, so kids of varying sizes can slide down at their comfort level. Toboggan during the day or at night. Sledding is a ton of fun, but you also want to make sure you and all your family members stay safe. Here are some tips. Wear protective clothing. Layer up with hats, coats, gloves, snow pants and sturdy shoes like winter boots. Be careful with scarves, which can get stuck in the sled or cause strangulation. Wear waterproof clothing if possible, since you might get covered in snow. Avoid head injuries by providing everyone who is sledding with a helmet. Get the right equipment. Your snow sled should have steering and braking capabilities so that you’re in full control as you ride. Don’t use a non-sled, like a cardboard box, to ride down. Any item that is not a sled poses a danger to you if you ride down on it. Choose an appropriate hill. This is important not just for young kids, but for adults, too. Find a snowy, not icy, hill that isn’t too steep and that has a long flat area for gliding so you can come to a stop at the bottom. Make sure there’s plenty of snow where you’ll be stopping, so you don’t run into an obstacle or slide onto a non-smooth area. Only sled when there’s visibility. You’ll want to avoid running into obstacles, which can be difficult to see at night or in fog. Only sled on clear, sunny days, or at night when the entire sledding area is illuminated. Follow safety-first rules. Only sled face-first. Make sure an adult rides with any young child. Only go down the hill one snow sled at a time to avoid collisions. Never ride a sled that is pulled by a vehicle. It’s a good idea to test out your comfort on small hills before heading up to bigger ones. Make sure every snow sled passenger keeps their arms and legs in the sled area at all times. After all that sledding, you’ll want a nice comfy bed for you and your family to recover in. Sheraton on the Falls Hotel is a luxurious fallsview hotel that provides the perfect setting to rest up before and after sledding. Let us help you make your Niagara Falls vacation a memorable one. Reserve your room today, and book now Niagara Falls winter activities with our concierge team.